KPCC’s Early Childhood Development correspondent Deepa Fernandes hosts a conversation about those and other questions surrounding bilingual education in Southern California. Between 2007 and 2011, about 43 percent of California residents spoke a language other than English at home. As of March 2012, over 300 bilingual immersion programs made our state’s classrooms another place for alternate tongues. While many reports indicate rising interest in such multi-language schooling, there remain many families who feel an English-only approach to learning – especially in the K-6 context – is the better way to go. How do families choose which language(s) their children learn in? Are there priorities, outside purely scholastic ones, involved in enrolling kids in English-only or multi-lingual programs? And where does the extra-curricular – be it formal lessons or otherwise – fit into a school-aged child’s language education? 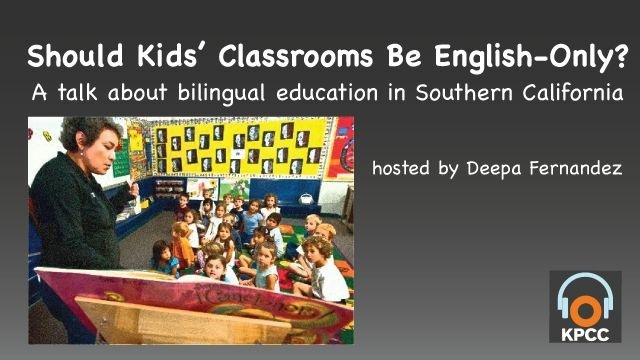 On Saturday, January 26th, KPCC’s Early Childhood Development correspondent Deepa Fernandes hosted a conversation about those and other questions surrounding bilingual education in Southern California. A panel of professional- and parent guests will kicked off this audience-inclusive discussion held at Los Angeles Leadership Primary Academy in Lincoln Heights. KPCC's Crawford Family Forum discussion broached a number of topics fro parents and educators deeply interested in bilingual immersion education — from difficulties starting and expanding programs in California to which type of bilingual program has been proven more successful. There were also some very candid conversations around education, culture and class. A few parents and teachers shared their story with KPCC after the event. Katja Jahn is a parent who is also a Board of Trustees member at Goethe International Charter School in Marina del Ray. Josefina Vargas is a parent of a kindergarten daughter who is attending the Los Angeles Leadership Academy and enrolled in its dual immersion program. She was originally very hesitant about it. Taina Franke is a parent of two sons. The first son is in second grade at the Goethe International Charter School. Her second son starts kindergarten in the fall. Ideally, she wants her kids to know German, Spanish, Portuguese and English. Hugo Enciso is parent of a child who is in a dual immersion program at Niemes Elementary School in Cerritos. KPCC Crawford Family Forum live-Tweeted the debate from @KPCCForum ; you can continue the conversation with the hashtag #Bilingualkids . What do you love or hate about bilingual education? Tell KPCC reporters by responding to this query!